Are you making a mistakes in a document and want to cancel it? Don’t worry about it. 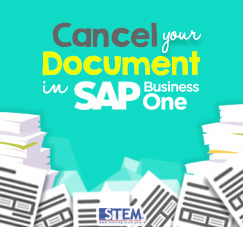 After SAP Business One 9.0, SAP Business One allows you to cancel marketing document. It’s really simple to cancel the documents. Just find the document you want to cancel, right click, and choose the “Cancel” or you can choose “Data” in menu bar and choose “Cancel”. There are two cancellation types. The first type of cancellations does not generate new documents. But will change the document status into ”Cancelled”. But, the second type of cancellations generate cancellation documents. The cancellation document appears with the title (Document Name)– Cancellation. Note that, there are some documents that can’t be canceled such as A/R or A/P Down Payment Invoice and Landed costs documents. But, for landed cost documents, you can manage perpetual inventory, and achieve the same result of clearing by creating a new landed costs document fully based on the old one. 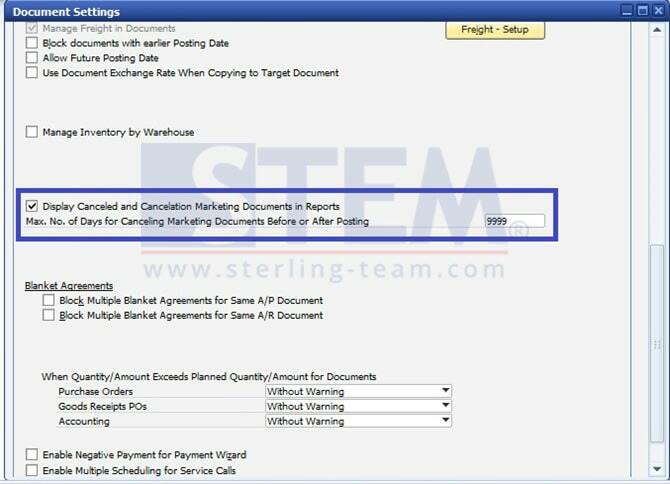 In addition to fit your businesses, you can define the time range and decide whether to put the cancellation documents into reports or not. These settings can be done in Main Menu: Administration -> System Initialization -> Document Settings -> General tab.